After getting approval of Adsense next step is placing ads. Google Adsense is one of the best contextual ad and high paying network. Google adsense have strict policies and if they find that you are violating any policy then they will ban your account. So always follow adsense policies. You Should Always know the maximum number of Adsense Ad units Allowed on A Single Page. You can add maximum of 3 content ad unit. sizes of content units are 336*280, 300*250, 250*250, 200*200, 120*240, 180*150, 160*600, 300*600, 120*600, 125*125, 234*60, 468*60, 728*90. These days 336*280, 728*90, 160*600 and 300*600 are very popular among publishers. But always remember that ads number should not increase more than 3. Google Adsense ad units perform when when it`s blended with your theme and place above fold. You can place maximum number of 3 link units. 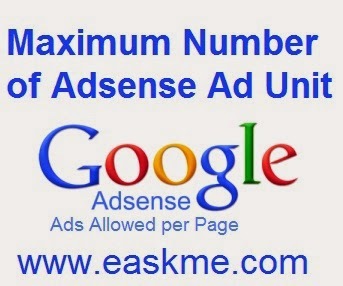 Here you can check the size of Adsense link units. You can ad maximum of 2 Adsense for Search units on a page. My experience say that two units work better than 3 units. Place ad above the fold work better. Please let us know how many ad units you are using ? How well they are performing?